The Sunface is a Fuzzface slightly modified. Not so easy to understand, isn't it? The first capacitor (C2, 2.2uF) filters the DC current at the entry of the circuit to avoid troubles with the next part of the circuit. This kind of capacitor (that you will find in a lot of circuits) is called a coupling capacitor. It also acts as a high pass filter, removing some bass frequencies. Enlarging its value will let more bass go through the circuit. 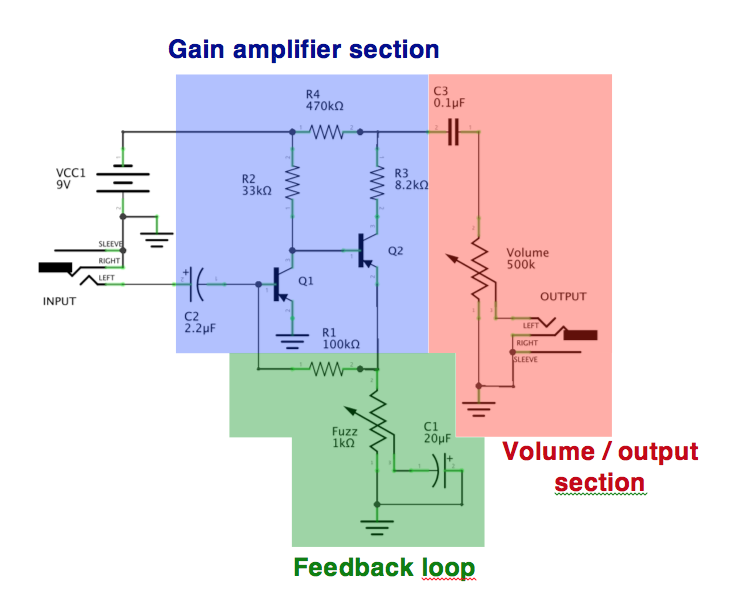 The gain amplifier section (blue part of the circuit) is a simple common emitter layout to amplify the signal. It has the maximal gain possible in this configuration: the emitter is directly connected to the mass, and the collector is directly linked to the base of the second transistor. It is a very classical layout that you will find in many many transistor based circuits, even if usually a resistor is present between the emitter of the transistor and the mass. 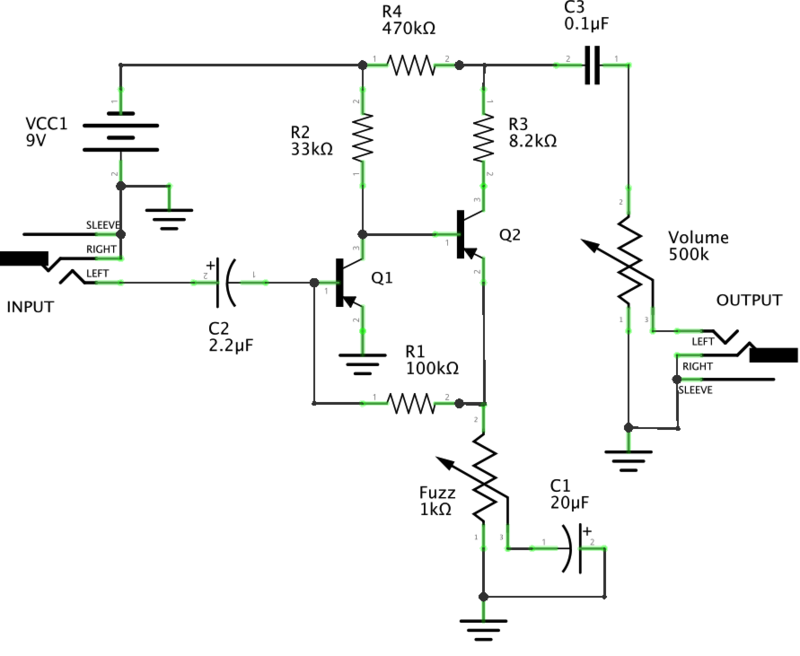 This stabilizes the circuit, and allows a fine tuning of the transistor gain by creating a negative feedback. The second transistor is in the same layout, except for its emitter. The main interest of the circuit is the feedback loop (in green). The emitter of the second transistor is linked directly to the base of the first one through a 100k resistor. A part of the current goes back to the first transistor, creating an amplification loop: current from Q2 comes back to Q1! The counter reaction (therefore the gain) of the second transistor is modified by a variable resistor placed between the emitter of the transistor and the mass: the fuzz potentiometer! By diminishing its value, the quantity of current going to the mass increases whereas the amount of current going through the feedback loop is diminishing. If the value of the variable resistor increase, more current goes through the feedback loop: the base of Q1 receives more current, saturation increases. The volume / output section (in red) is the simplest volume control that you can imagine: a 0.1uF coupling capacitor to eliminate DC current, and a volume potentiometer wired as a variable resistor. 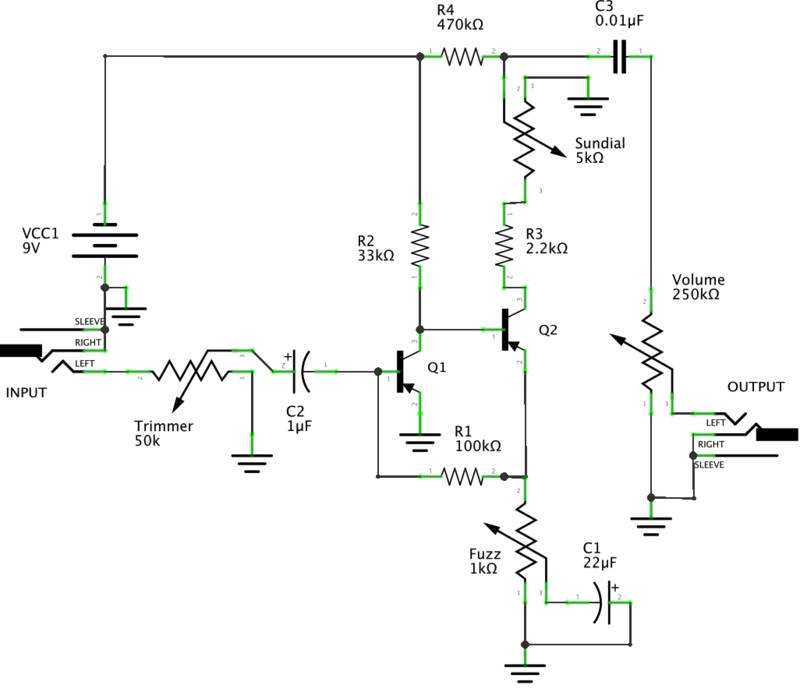 The output signal will be more or less important depending on the value assigned to the potentiometer. The Analog.man version of this circuit introduces some little improvements to this circuit. First of all, a trimpot (wired as a variable resistor) is present at the input of the circuit before the 2.2uF capacitor. Thus, the entry impedance can be adjusted a bit. It plays the same role as a guitar volume pot, so you can adjust the fuzz gain, which is really useful for high output pickups for instance. Another modification to the circuit is the 8.2k resistor that is replaced with a 2.2k resistor plus a 5k linear potentiometer. I prefer to use a 10k potentiometer so the original 8.2k value is reachable. This modification allows you to set the bias of the second resistor. It is useful in order to have the maximal gain, especially as the circuit is really temperature-sensitive. Finally, some values are changed compared to the original circuit: the coupling capacitor is 1uF and the one before the volume pot is 0,01uF. The volume potentiometer is 250k. All together, this will remove a bit of low end, making it a brighter fuzz. This is probably done in order to compensate the deeper tone of the NKT275. Nothing difficult, but still good improvements to the circuit ! One of the biggest issues can be biasing the transistors. While calculators are cool, I found that replacing the 2.2k resistor and the 33k resistors with trimpots (I chose 50k as the value for both on my last build, although using a lower value for the 2.2k would be more ideal) is really the way to go. Using a DMM, first you measure the voltage at at Q1's collector and adjust it's voltage using the trim pot at the 33k resistor. You want to do this one first as Q1's voltages effect Q2's voltages. Once you have that one at a reasonable number (I think -1.6v is recommended but I prefer numbers around -1.1v as it seems to quiet down the pedal quite a bit), move on to Q2 and adjust to -4.5v using the trimpot that replaced the 2.2k resistor. I like to keep the bias pot at noon so any adjustments that need to be made because of temperature can be done in either direction. Using this method, I can audition multiple transistor combos without having to sweat the biasing. Very insightful comment. Thank you for sharing your experience! I will give it a go on my next Fuzz Face pedal! My son and I spent a fair amount of time trying to get this circuit to work before realizing that R4 should be 470 ohms, not 470 kilo-ohms. If you can correct the diagram, you might save some other people the trouble. Thanks! You are right, I will correct the schematic asap! I made the schematic myself using Fritzing!